This is Brian, Principal at Le Pera Elementary School. His school is based in Poston, AZ, approximately 20 miles south of our OneSight clinic on the Colorado Indian Tribe (CRIT) Reservation. After pre-screening vision needs for the approximately 240 students enrolled, 104 of his students showed signs of vision issues and were able to attend our clinic. 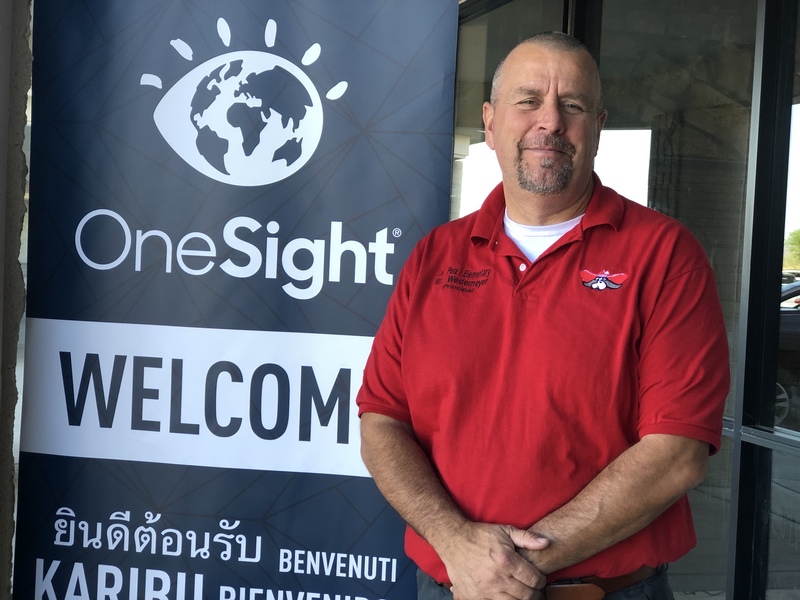 Brian believes the greatest obstacle standing in the way of their access to vision care is their rural location and low income demographic, making transportation and affordability difficult. He expressed his excitement for his student’s access to vision care, because he understands how clear vision impacts academic success. “If they are doing better in school, then they are going to be more confident. They will then be able to build better social skills and better self esteem. All of these things go hand in hand.” He related his student’s access to OneSight’s clinic back to the “growth mindset” that they have adopted at their school called “Rebel’s Rise,” where they talk constantly about not giving up and not saying “I can’t.” Or if they have to say “can’t” adding “yet” to the end, lending opportunity to daily growth. Knowing that 80% of learning is visual, our team was honored to provide exams and glasses to Brian’s students and take another step towards eradicating the global vision care crisis in our lifetime. There are 239 million children between the ages of 0-14 in need of vision care, and now Brian’s students don’t have to be a part of that statistic. and will have a chance to learn with their full potential. We’re unlocking the full potential of kids all over the world. Give a new pair of glasses to a student in need for as little as $10.